WHITE ORGANZA FAVOUR BAG with 3 MINI PERSONALISED MINT or MILK CHOCOLATES inside. Your names and date of wedding can be added to the front of all of the wrappers and there is room for a short message, eg: "Thank you for sharing our special day" to be printed on the back of the chocolate wrappers. 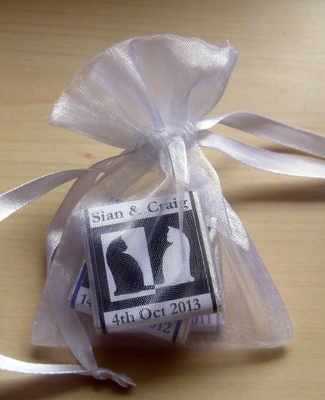 Please choose which colour co-ordinating black and white wedding design you would like on your chocs. If you would like the white bag but don't want one of the designs listed please e-mail me on info@itsawrapcornwall.co.uk and I can take the order by e-mail. NB: THIS WHITE ORGANZA BAG IS AVAILABLE TO BUY SEPARATELY ON IT'S OWN IF YOU WANT TO ADD YOUR OWN FAVOURS INSIDE: PLEASE SEE SEPARATE LISTING.